This Barbecue Beef Boneless Rib Recipe caters for all tastes. You can do rare and well done from the same rib at the same time and have fun too! What’s more, this barbecue beef rib recipe makes for easy carving and simple cooking. 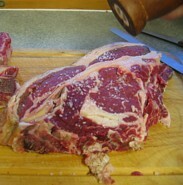 Everyone likes beef cooked differently which complicates the cooking and stressing the chef. Here’s a way to satisfy all tastes and involves everyone to make for a truly social occasion. 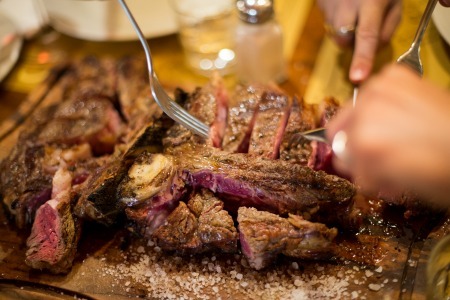 My inspiration is from Tuscany, Italy where the dish is described as Bistecca alla Fiorentina and what we’re going to do is cook the meat twice. The first time in a nice relaxed way so we can have a drink and enjoy the atmosphere, the second time just to finish off and everyone can give their steak a flash on the grill to make sure it’s cooked to their liking. Of course if everyone likes their beef rare – just skip step 2! Check with your butcher to make sure you get the best. Ask for a ribeye. In order to get the nice thick steak you need for this recipe ask your butcher to cut two ribs together and then get him / her to remove the bone. 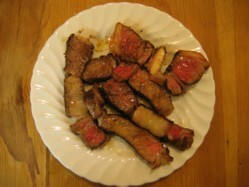 The key to success with this barbecue beef boneless rib recipe – simple fresh ingredients. Let’s get cooking! For the vinaigrette mix 1 part balsamic vinegar to 4 parts extra virgin olive oil and stir in a spoonful of honey. I like to serve a green salad side to go with this, just a pinch of salt, a drizzle of olive oil and squeeze of lemon – simplicity itself! Prepare a good amount of hot coals and remove your boneless rib from the refrigerator because you want it up to room temperature before cooking. If you sear ie. use intense direct heat for a short period of time straight from the refrigerator then the core of your steak may still be cold when you come to eat it. Resting will help bring the core temperature up but ensuring that your steak is at room temp before cooking will just give it that extra helping hand. It's a really thick hunk of beef so don't be afraid to give it the full 20 minutes. You'll be rewarded with a fantastically crisp exterior and beautifully pink meat on the inside. Salt toughens meat, adding the salt when you've got a nice crisp exterior means that the salt won't penetrate into the muscle. When cooked, allow it to rest for about 15 minutes before carving nice thick slices as this will help keep your boneless rib moist and give time for the core temperature to stabilise. You can now eat it exactly as it is or return to the BBQ grill for a quick flash for those who prefer it cooked further. In short, this barbecue beef boneless rib recipe allows you to serve a steak exactly how your guests like it without having to time each individual steak and remember who's whose. Simple and no-one’s disappointed. Prepare thick slices, drizzle with the balsamic vinaigrette, a squeeze of lemon and tuck in! Savour the flavour……………and remember it for next time.